The United States Fish and Wildlife Service has established the Craig Brook National Fish Hatchery in East Orland, Maine to propagate and stock juvenile Atlantic salmon. The hatchery takes great care in the repopulating efforts for the endangered salmon. Therefore, an easily maintainable and corrosion resistant environment is essential where restoration efforts rely on producing healthy salmon offspring. The Craig Brook National Fish Hatchery uses crowding pools to raise the young salmon, or fry. The hatchery’s existing roof frame systems, located over the crowding pools, had succumbed to years of environmental corrosion and were in need of replacement. 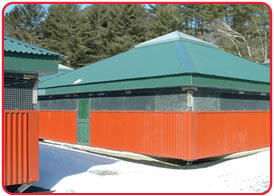 In the spring of this year, the choice was made replace the dilapidated roof frames. Because the environment surrounding the crowding pools is moisture rich and unheated, Apex chose Strongwell’s EXTREN® structural shapes. The fiberglass structural shapes solved the low maintenance challenge and also provided the non-corrosive environment necessary to produce the young Atlantic Salmon. 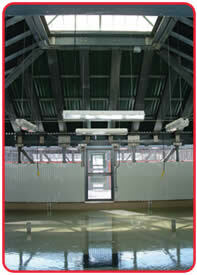 The fiberglass framed structures were built on top of the existing concrete tanks. The EXTREN® shapes were combined with stainless steel gusset plates to form the corrosion resistant roof framing. The result was a unique and appealing appearance. The initial investment in FRP provides the Craig Brook National Fish Hatchery a maintenance free future with improved cost effectiveness over time.